While Aubry, Joe, Cydney, and Tai are celebrating their big Scot blindside, the three not part of that vote are a little salty. Tai apologizes to Jason after leaving him out to dry with the Super Idol, so Jason calmly listens while plotting his game revenge. Julia and Michele are upset they were left out of the plan and have alternate ways of restarting their game after this speedbump. 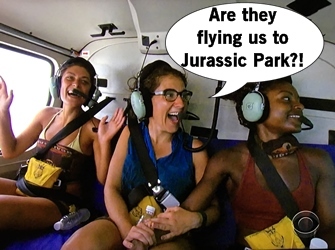 Michele wins the Reward Challenge alongside Cydney, and they invite Aubry along for a day of helicopters, fried chicken, coleslaw, wine, and strategic bonding to get back into the fold. Julia and Jason scheme options to vote out Tai, then feast on Mark the Chicken when they succeed. Oh boy, now you're on Mark's shitlist. The Reward Challenge is a real dull one to watch as everyone stands on a platform memorizing pictures/numbers to decipher a combination to unlock a puzzle. Michele wisely uses sand to write out her numbers and narrowly beats out Julia solving the completely obvious word puzzle, "BLINDSIDED." With immunity around her neck and back in the good graces of the four running the game, Michele is smooth sailing for 3 more days. But Michele is taken aback when the alliance wants to put the votes on her bestie Julia since the girl is strategic, well-liked, and good at challenges AKA will beat everyone at the end. Michele tells Julia she is still part of the plan to vote out Tai, an idea Cydney toys with as well. Who'd be a better person to leave in the game: Tai or Julia? Tribal Council time! Julia and Jason talk about every move and action going forward will affect the decision at the end of this game. Julia says Michele and Cydney are on the bottom of the alliance and that Tai could win the whole game. Tai thinks the five should stay tight and not jump on a sinking ship, and you know I love a good Titanic reference. Jason warns that Tai has flipped twice before and a third time is probably coming. Tai tries to explain that he voted out Scot to break up a strong pair, which Jason thinks is funny since Tai joined up with super tight pair Aubry/Joe. Cydney believes the jury will reward strong gameplay, not the kind of player that throws people under the bus to get ahead. Jason tries to sell the value of him and Julia as a lonely pair ready to make a move, but it's too late. Despite a brief panic by Tai who asks Aubry if he should play his idol (with the most awkward whisper grab in Survivor history), Julia is voted out of the game and Michele sheds a tear for her eliminated friend.